I love owls! I have something owl-related in just about every room of my house. 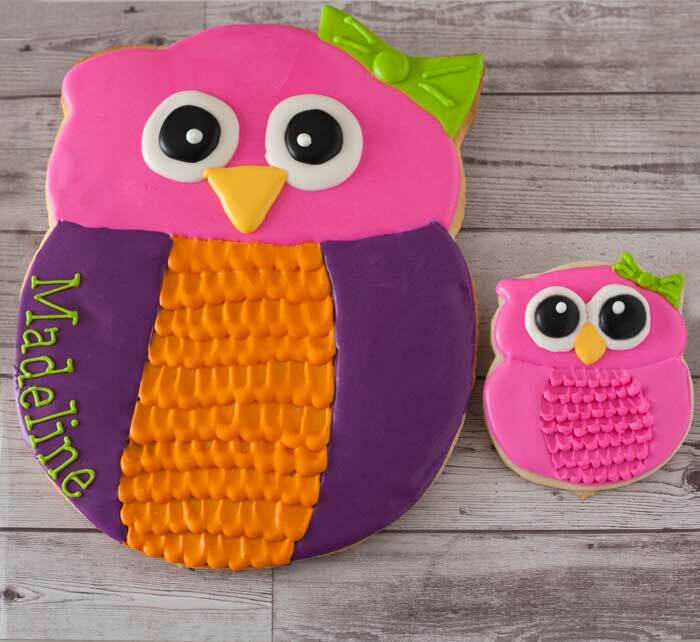 When this request for birthday owl cookies came in, I was really excited. I was also asked to make a large cookie for the birthday girl. A large cookie is anything bigger than five inches, but I felt that a cookie somewhere between 10 to 12 inches would be a perfect size. Finding a cookie cutter that size is be pretty much impossible, so I had to figure out how to make it. The owl cookie cutter I used is from here. I liked that the owl had a little bow, it made it more girly. I followed this tutorial by the Bearfoot Baker. I started out by taking a food coloring maker and drawing the sections for the head, wings and body. I piped and flooded the heads. Then I took piping icing and made small dots in the body section starting at the bottom and working to the top. While the dots were wet, I took a knife and pulled the icing towards me to create the feather look. Once the body icing dried, I flooded the wings. I made templates for the eyes so I could create royal icing transfers. I made the black part of the eye first and allowed it to dry, then placed them on top of wet white part. Once the eyes were completely dry, I adhered them to the owl with white icing. In the past I've had problems with bleeding on my royal icing transfer, so that's why put them on the after the head icing was dry. To make the large cookie, I started out by taking my owl cookie cutter and tracing it out with pencil. I went over the tracing with a black sharpie. Then I brought the tracing to the scanner. I took some screen shots from my computer to show some of the important points. I made sure that my document type was changed to black and white and the resolution was set to 300 dpi. You want a high resolution image when it's brought into Photoshop for resizing. Once the image was scanned in, I made sure that I saved the image as a PDF. You can save it as a JPEG if that works better. Once I had the scan saved, I opened it in Photoshop. If you don't have Photoshop, you could just take the tracing of the cookie cutter to a print shop for an enlargement. I knew that I wanted the owl to end up between 10 to 12 inches and I wanted to be able to print my enlargement at home. I had to use a legal sheet of paper. Now in Photoshop, I had my scanned cookie cutter PDF open and a blank new document open as well. I used the rectangular marquee tool to select the owl. With the owl selected, I copied it by either using the drop down Edit>Copy or Command + C on a Mac. Then I moved over to the blank new document and pasted the owl by either Edit>Paste or Command +V. With the owl pasted, hit Command+T. A bounding box (box with handle square at the corners) should appear around the owl. Make sure to hold down the shift key and pull on one of the corners to make the image larger. Once you have the image the size you want, you can print it out. Make sure to change the size of you paper to legal size. When the image is printed out, you can cut it out and you have a template to cut out the dough.